The ladies face on the gift packaging cracks me up in this picture! I admit it - I Kate, am the type of person that either buys or is gifted body butters and rarely ever uses them to moisturise (or even normal lotion for that matter. My skin must hate me!). I was given a Soap and Glory gift set as a leaving gift for my old place of work, and this beauty was part of the set. For those of you who might not be familiar with Soap and Glory, it's a skin care brand that is probably known not only for its great products - but adorable girly packaging! I'm an absolute sucker for the stuff! I've been trying to tackle the mounds of Bodyshopbody butters I had got for christmas, but this has certainly taken the cake, it's moved them off my bathroom side and back into the back of the cupboard for now. 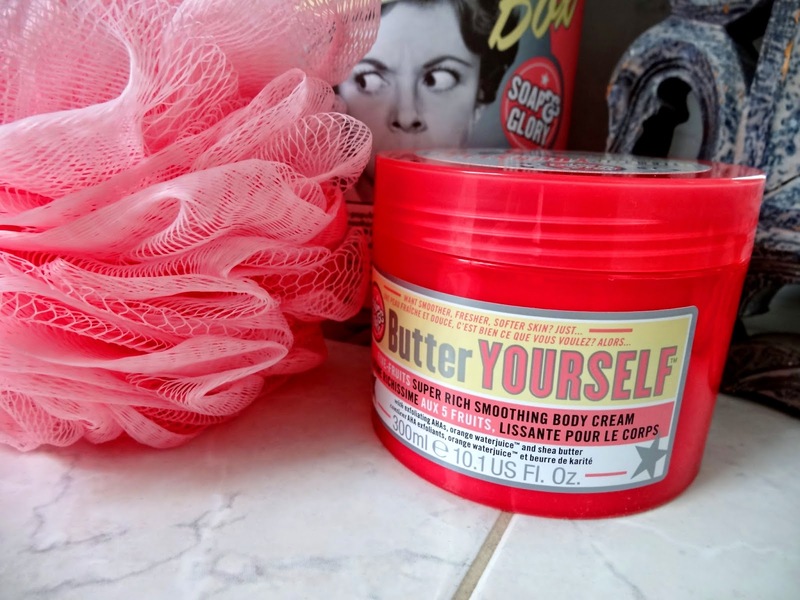 The smell of this 'Butter Yourself' body butter is so yummy! It's the kind of smell you'll love on your skin - it really isn't sickly! The consistency is thick, but melts away into the skin like a charm! One thing I tend to dislike about body butters is that they sit on the surface of my skin for a while, which not only makes it difficult for you to wear clothing over, but also in case you get the product accidentally on something else! This seems like an amazing product! Thanks for the review! Following you on gfc now.